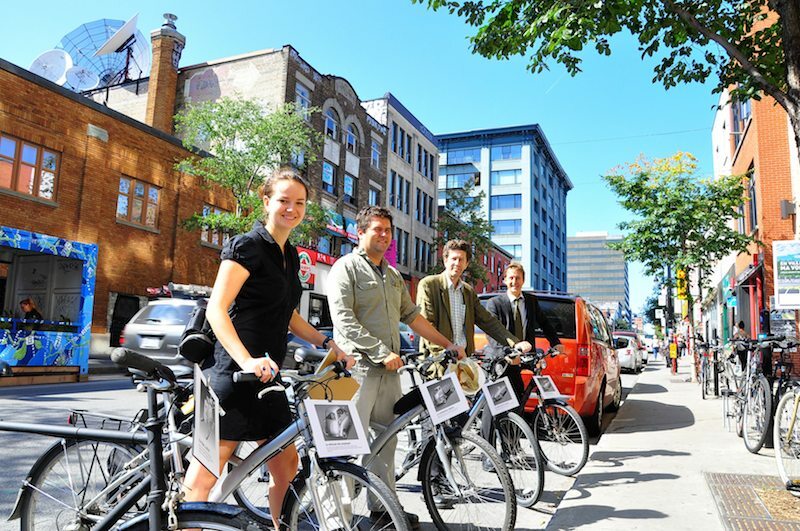 Easily squeezing their entire corporate fleet of five bikes into their designated plot of parking space, five company representatives (including the president) were on-hand to answer questions about the bikes, which each sported posters identifying and describing what each bike represented. A company bike in the company colours and outfitted with a BionX motor (and sometimes a Burley Travoy trailer) was labelled “an operator’s utility bike”, while two non-electric bikes used by seasonal employees and visitors were labelled “the employees’ vehicles”. 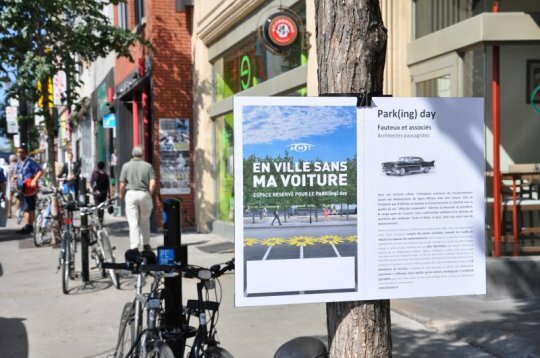 The company designs bicycle paths, lanes, and green alleys within various urban design projects (including public plazas and parks, and school campus and institutional grounds). As part of its operation, the company regularly visits clients that landscape. 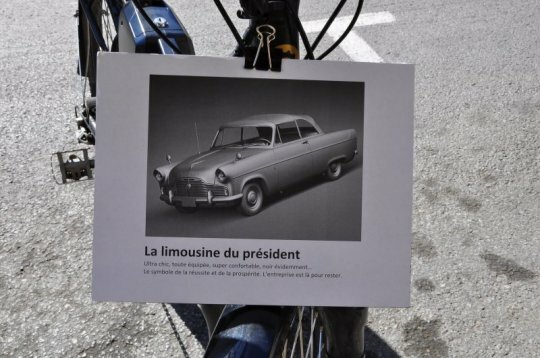 Four years ago, president Marc Fauteux bartered his large family car for an electric bike with which he performs the majority of these business trips. 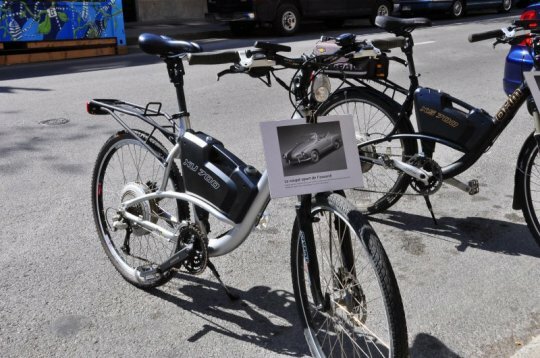 Since then, the company has acquired two other electric bikes for its project managers, in addition to two regular bicycles available for all the employees to use. For travel to the city center and to destinations within 10km from office, the lightweight electric bikes enable spontaneous and efficient travel, get staff to their destinations faster than by car, are ecologically-friendly, and are really enjoyable for all, helping avoid interminable traffic jams and the difficulty of finding a free parking space. For larger distances, the firm also relies on car sharing and public transport. The display attracted curious passersby, who dropped by to ask questions about the e-bikes, and to comment on how cool they were and how they were thinking of introducing e-bikes into their workplaces in similar ways. Marc Fauteux, the brain behind the interactive exhibit, shared his personal reasons for and experience with switching over to using e-bikes. 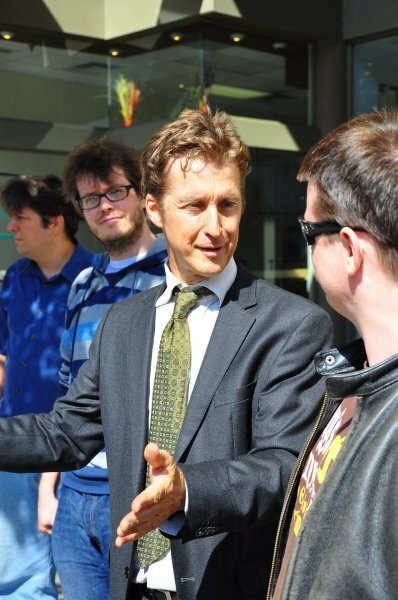 Because his job requires making unexpected on-site visits as needed, Marc, who lives within walking and biking distance to his office, in the past would have to drive his car to work and deal with the hassle of finding parking every day, because of the off-chance that he might be called to a meeting somewhere far away. 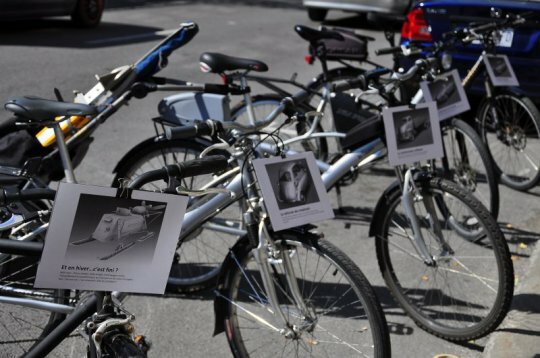 He recalls days when he would be lulled into biking to work instead of driving, and then get called to a meeting, which meant having to bike home to get his car to drive him and his team to the necessary destination. Or he would have to bike laboriously over hills to visit his clients, and show up looking sweaty and unprofessional. Though they wouldn’t actually comment on it, Marc could sense how his clients saw him – as someone who couldn’t afford a fancy car, or who had so much free time that he could spend it biking to meet his clients (who were paying him by the hour). Marc considered buying a scooter or motorcycle, but dismissed them because he did not want to have to deal with things like looking for parking, putting up with traffic, and paying for gas and maintenance. After buying his OHM, Marc has never again had to worry about the impressions he makes on his clients when he makes his site visits. 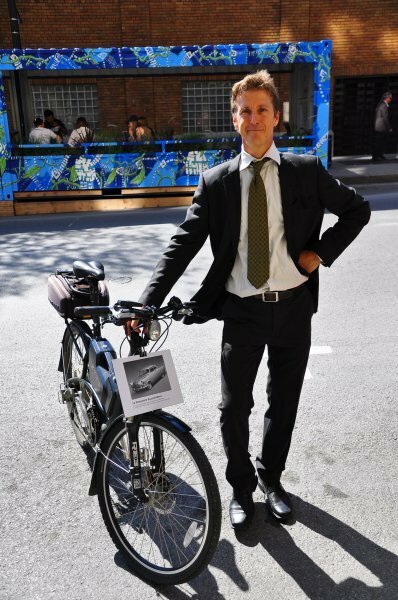 When he pedals up in a suit, sweat-free, atop his sleek OHM Sport XS750, his clients are always impressed by the technology and high quality design of his bike, and never question his professionalism. 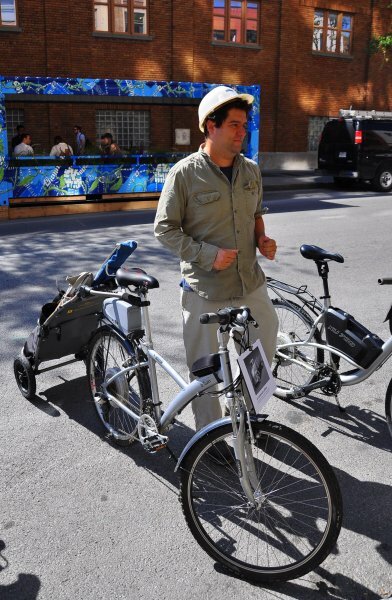 With three electric bikes and a bike trailer in his roster, Marc is able to show up on-site with up to two other company representatives and full gear, without a car. 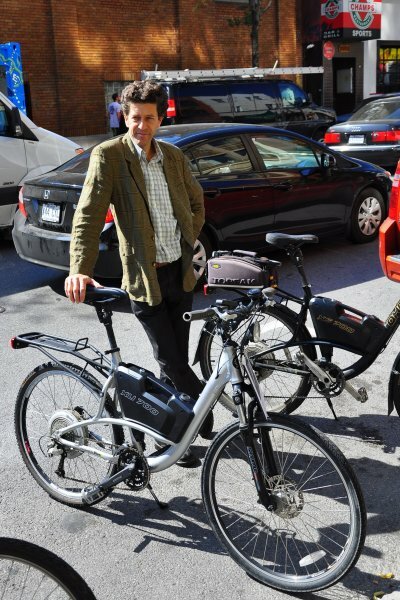 Marc was excited to spread his enthusiasm for e-bikes: “The event was a great way to make us aware of the great use we make of public space just to park cars, when we don’t always need to use them. 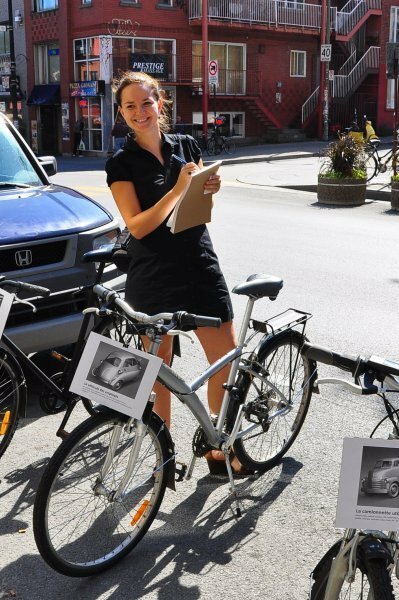 Thanks to Cathy Lau from OHM Cycles for this guest post!